I have a love/hate relationship with Season Finales of my favorite shows. 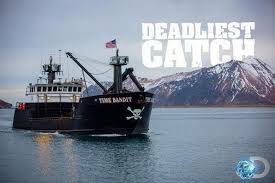 Deadliest Catch is no exception. Usually the most compelling footage of the Alaskan King Crab season is saved for last, and It’s usually amazing. Knowing at the end that it will be another year before I’m back on the Time Bandit riding big waves, and vicariously catching crab with Jonathan and Andy makes for a bittersweet ending. Hopefully Discovery will milk this cash-cow for 2 or 3 lost footage specials and a “Captain’s Tell All” episode! 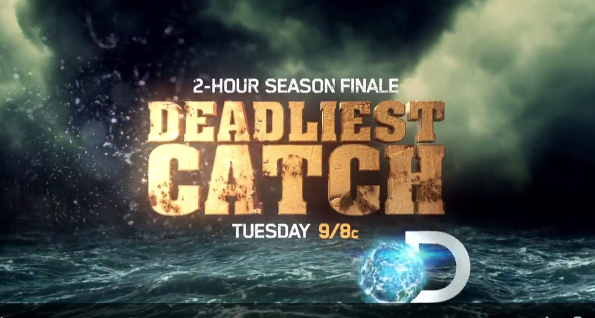 Tonight’s Deadliest Catch finale delivered a solid end to an insane season, well worth the watch and ultimately the wait for season #12! 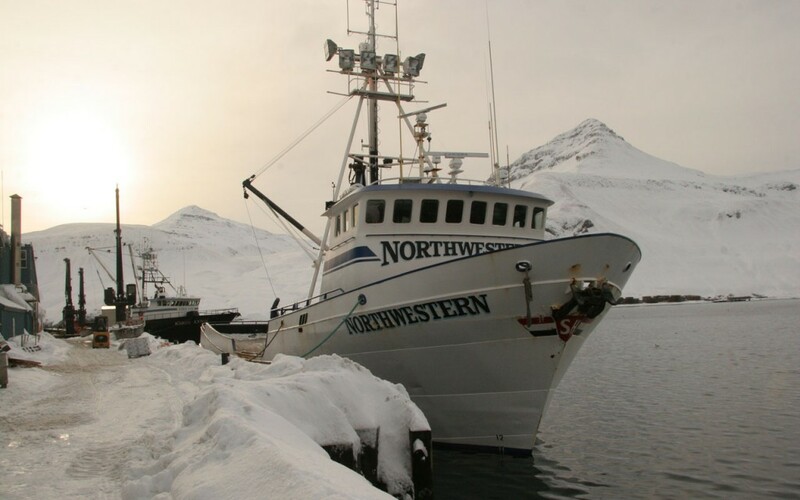 Newbie Captain Jake Anderson went from “zero to hero” during the final days of Opilio season. 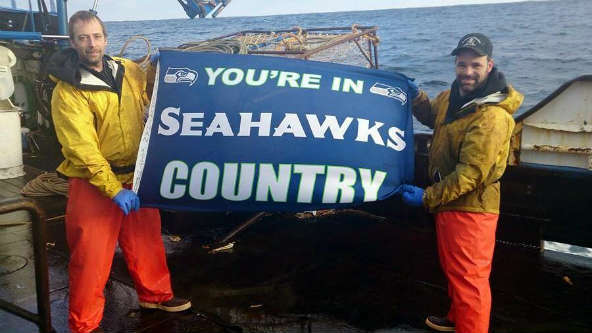 Jake should be proud that in the final stretch it wasn’t Sig Hansen getting him on the crab, it was sheer dumb luck. His chances didn’t look too good last week when he made his,”I’m the Captain now!” speech, but his pots landed in the right spot due to a freak accident tonight.The Saga was heavy with ice and the crew began knocking big chunks off to minimize the added weight. Inside the holding tanks the boat began making horrible banging noises. Jake has the crew clear the decks and off load the pots so the crew can check the tanks, dumping pots 20 miles from where he has plotted to fish. 3-30 foot beams had broken loose in the tank, yet didn’t miraculously didn’t cause any damage! By removing the beams with the crane the crew is back to fishing quickly. Nobody is more surprised than Jake when they pull in full pots of crab after dumping them over the side to fix a problem. Jake lucked into his quota and gaining some needed self-confidence and respect from the crew. The deckhands earned a nice $35k for the season. Josh Harris has been a disappointment to viewers who have been rooting for the 25% owner of the Cornelia Marie to find success after his father Phil Harris’s untimely death a few years ago. Josh is great at sitting in the wheelhouse, as he amply displays each episode, but his Captain skills are relatively non-existent.The ONLY Captain on the Cornelia Marie is Casey McManus. Unlike a Captain, Josh’s presence isn’t required and is sometimes hazardous to the operation. ( Like when he put the CM into the wrong gear and almost took off Casey’s hand! ) Keep listening to your Ipod and updating your social media accounts Josh and let Casey run the boat. On the Wizard Captain Keith Colburn is still singing the “Greenhorn Blues.” Amy Major’s didn’t have the strength to keep up with the pace of the boat, so Keith replaced her with a “man.” I use the term “man” loosely because this guy (Rigel lol ) took the Captain for a free ride courtesy of the Time Bandit’s health insurance plan. On #TheBait something new in store for the Wizard-Salmon tendering! It’s Great potential income for the boat during off- season from crab fishing,plus having Mike Fourtner explain how the boat was retrofitted is really interesting. Keith’s fishery will be diversified and increase his income 50% More work for brother Monty Colburn now too. Very beneficial for the Wizard and Time Bandit to have 2 owner-Captains per boat. They can trade-off Captain duties in the different fishing seasons and keep the boats working full-time. That’s how you make money in the Bering Sea Josh. 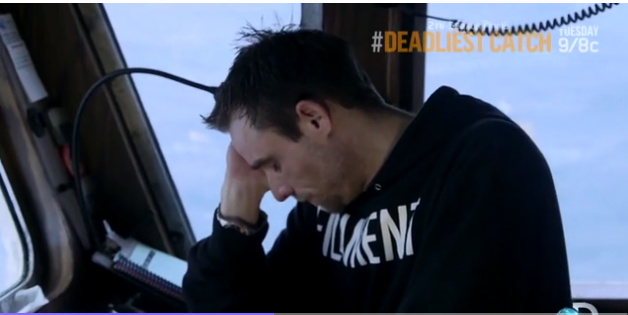 Why have we been Hllstrand light on “Deadliest Catch” this season? The 2 brothers are fan favorites (and mine too)! The crew body-skating on the frozen Time Bandit deck last week was a great moment! On #TheBait Andy and Jonathan reflect on the season and the difficulties training an entirely new crew. Back on the crab grounds the polar ice pack is 15 miles from the Time Bandit. Armchair Captain Andy from home gives Jonathan advice telling him to pull his pots and move. Jonathan continues to set his pots back not wanting to leave his honey spot! 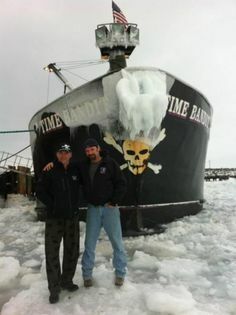 The Time Bandit is literally walking distance from the ice as Jonathan’s risk pays off. That’s how you catch crab Hillstrand style. Maybe in the off-season we will get another hit of “Alaskan Monster Hunt” out of these two? On tonight’s #TheBait the Captains discuss Sig’s losing his 3 key Northwestern crew players this season – Edgar Hansen to back injury, Matt retired, and Jake Anderson left to Captain the Saga. Lots of unbridled animosity for Jake by the Northwestern’s remaining crew and Captain. Jake let Sig Hansen down at the last-minute and won’t be forgiven. Sig Hansen made a quick off-load setting back pots before leaving his spot. He planned a fast turn-around to get back to the frozen crab grounds, racing to save 75 pots worth of crab and gear. Unfortunately the Northwestern’s crane begins leaking hydraulic fluid everywhere due to a small broken fitting. Edgar Hansen is able to climb the crane and fix the part-amazing save! The grind begins-no time to stop due to the ice. Pulling his pots in with 500-600 in each put a smile on the crews faces! Sig’s tank was so full it created a crab jam. Nick had to get in the tank and spread the crab out. (He got pinched in the pee pee too!) 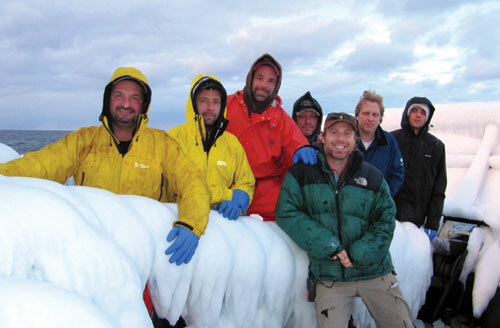 Each one of the crew earned $112,000 for the haul! Sign me up on that boat.